People are talking, “there’s a lot going in Comox” and it’s true. It seems that everywhere you look there are new developments underway. From the construction of 34 new suites at the Berwick Retirement Home to the redevelopment project in Marina Park, to the recently completed Townhouse development on Anderton Road, to the upcoming construction of ‘The Element’ at the Waterfront’ condos below Harbour Centre, to the nearly completed condo development on Comox Avenue, there is a lot going on. All of these projects help to revitalize our downtown core. More people means more demand - which leads to more opportunities for our retail and business sector. Perhaps the most exciting change is the upcoming redevelopment of the Comox Centre Mall. New owners PDG Investments are in the final phase of approvals for what will be an extensive redesign of the property. The new look coupled with a number of new retail tenants will be a great refresher both visually and experientially for Comox retail shoppers. The redevelopment of Comox Marina Park is also underway. The construction of new pathways, additional landscaping and public buildings are in full swing and the planning for the new Comox Rotary Splash Park is well underway. Completion is scheduled for Spring 2017. I have said repeatedly that it is vitally important that Comox residents have everything they need and want here in their own community. That continues to be the priority for Comox BIA. 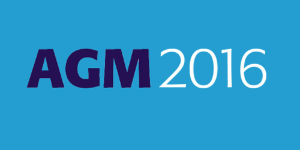 I would also encourage everyone to join us for our Annual General Meeting, Wednesday, November 16, 2016 @ 5:30pm, lower level of the Blackfin Pub. Earlier this year Comox BIA signed a Memorandum of Understanding with Comox Valley Economic Development and Tourism (CVEDS) to collaborate on a number of initiatives and projects. This included providing opportunities for Business Counts Workshops for BIA members, improved profile in Comox Valley marketing campaigns and business development opportunities. Due in large part to this partnership we’ve seen a number of successes. The 2016 Comox By The Sea Celebration, held at the Filberg Heritage Lodge and Park, was an overwhelming success. This year,thanks to significantly enhanced marketing campaign, the event welcomed more than 2,000 patrons to the downtown area – which is double the number that took in the Festival in 2015. Tourism this summer in Comox and the Comox Valley wasn’t just up – it was way up. Measurable statistics include: Passenger volumes at YQQ up 8.9%, hotel stays are up by 29%, true visitors to the Vancouver Island Visitor Centre were up by 15% and the # of Daily Visitor Count Average to Website (June): 1435 (474%+). In October Comox BIA hosted the first of our CVEDS Business Counts Workshops downstairs at the Blackfin Pub. 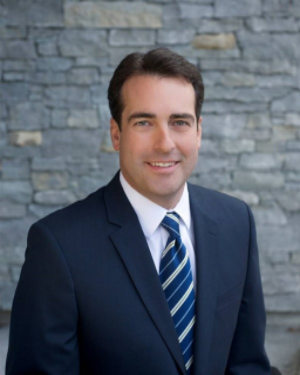 That event focused on Internet and Social marketingfor small business, with guest speaker Dan Dagg, President of Hot House Marketing, one of the most successful marketing organizations on the Island. 40 Comox BIA members attended the seminar and found that it provided real, usable information. Many of those who attended asked that Dan return to present “part 2” and we are working on making that happen soon. If you couldn’t make it to the first one, don't worry – you are most welcome to attend the next one. For those of you who don’t remember, 2016 Festival Weekend in Comox was when summer actually arrived. The entire weekend was picture perfect with warm temperatures and sunny skies. Thousands of visitors and locals came to Comox By The Sea to enjoy the Filberg and Comox Nautical Days Festivals and the I-Hos Night Market. This year for the first time the Comox BIA in partnership with Comox Coach and Shuttle sponsored the “Festival Weekend Shuttle”. Throughout the weekend the shuttle provided free transportation with pick up/drop off points at the Cliffe Avenue Starbuck’s in Courtenay and the Comox Town Circle. The Comox BIA felt it was important to sponsor this initiative to support not only the Festivals but to provide opportunity for more engagement with Comox retailers. It was well received and is being considered again for 2017. Comox BIA also partnered with The Filberg Festival on the “Filberg Bucks” initiative. 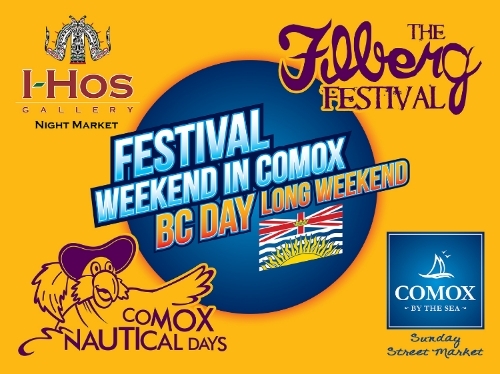 Many Comox retailers took part in this patron friendly promotion providing $5 Filberg coupons to thousands of consumers who shopped Comox prior to the Festival. There were a total of 3,500 coupons distributed and about 800 “Filberg Buck” coupons were redeemed during the Filberg Festival, which is a usage rate of nearly 25%! The Comox BIA also sponsored the Comox Nautical Days – BC Day Parade. This year, for the very first time, the Lieutenant Governor of British Columbia Judith Guichon attended the BC Day celebration in Marina Park and participated in both the parade and the Ceremony of the Flags. Plans for Festival Weekend 2017 are already underway and the Comox BIA will be there to once again support these important community events. Comox Valley Rotary clubs, Comox BIA and the Town of Comox have joined together to create the Rotary Marina Splash Park as part of the Comox Marina Park Enhancement Project. The 'splash park' will create a wonderful place for young Comox families to play close to home in a unique ocean side setting. A number of grant applications have been submitted and are being considered by various funding agencies but these grants won’t be enough to complete this important community project. 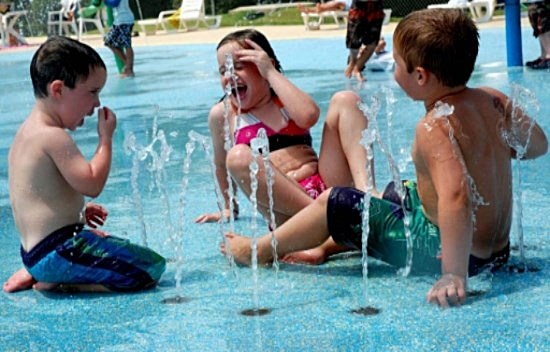 The Comox Valley Rotary club in partnership with Comox BIA are embarking on a major crowd funding initiative in support of the Marina Park ‘Rotary Splash Park’ using a crowd funding platform. Many Comox businesses have already joined the effort supporting the campaign by providing incentive gifts allowing those who donate to select from an array of outstanding retail and experiential products. Thanks to Mary's Cafe and Bakery, Nearly New Books, Planet Kids, Roxanne's Fashions, The Cottage Clothing Company, Coast Surf Shop, Compass Adventure, Blackfin Pub, Woofy's Pet Foods, Comox Community Centre, Desolation Sound Yacht Charters, Sue Medley, Anela Kahiamoe, Jim Papp and many more. If you too would like to join the fund raising initiative by supporting the incentive gift program please contact Rotary Club of Comox representative Stu Tunheim at stutune@gmail.com Thank you all for your encouragement and support. Completion of the water park is targeted for spring 2017. 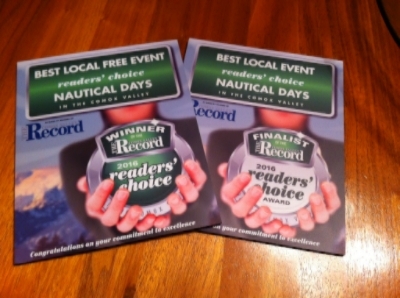 Congratulations to all Comox BIA member winners of the 2016 Comox Valley Record Reader's Choice Awards! 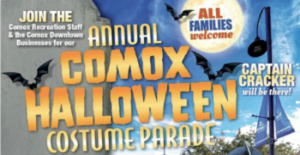 Thanks to Comox Community Centre staff, Comox Centre Mall and all participating Comox BIA members for making Halloween 2016 a great success!